Special needs penalty costs really bother me. Why should families pay $75 for a special sit-upon therapy ball when we can get the same damn type of ball (or sometimes, a better one) from Target's yoga or Pilates section for $29? "Right now it's kind of a Wild West in terms of app development," [Rosa] explained. "A lot of people who have experience with kids with special needs are putting out apps. They have great ideas and great content, but unfortunately they sometimes have clunky designs and clunky interfaces." The special need professionals who develop apps have a wealth of talent and experience that traditional developers should tap, because they can repackage most apps for kids with special needs as early learning apps for typical kids. Then these apps could have top-notch UIs and design, and wouldn't need to have the special needs penalty costs attached to special needs apps due to developers anticipating a limited market share. It's absolutely true. I'd love so see more developers enlist the speech therapists, occupational therapists, behaviorists, special ed teachers, and parents who are making such fantastic (if sometimes rough-around-the-edges) apps, and bring them into the fold. In an app development environment that expects developers to produce new apps every six weeks, why not do what software producers have been doing for industry aeons -- take the special needs apps' chassis and content, rework them as "early learning" or "toddler" or whatever typical developmental age range is suitable, and release them for that market as well? You'll make more money! Then you can reduce the cost of the special needs apps, ideally. Some of this collaboration is happening already. Dawn Ferrer and Luna DeCurtis, the SLPs (speech therapists) and innovators behind the language-encouraging app That's Silly attended the May 2011 Dust or Magic children's app development camp in Monterey, and found themselves surrounded by other developers who were fascinated not only by the two women's professional knowledge, by also by how they and the children in their practice use apps to learn and play. I hope those developers were able to incorporate that what they learned from Luna & Dawn into their next wave of apps. And not all special needs professionals-turned-developers need hand-holding. 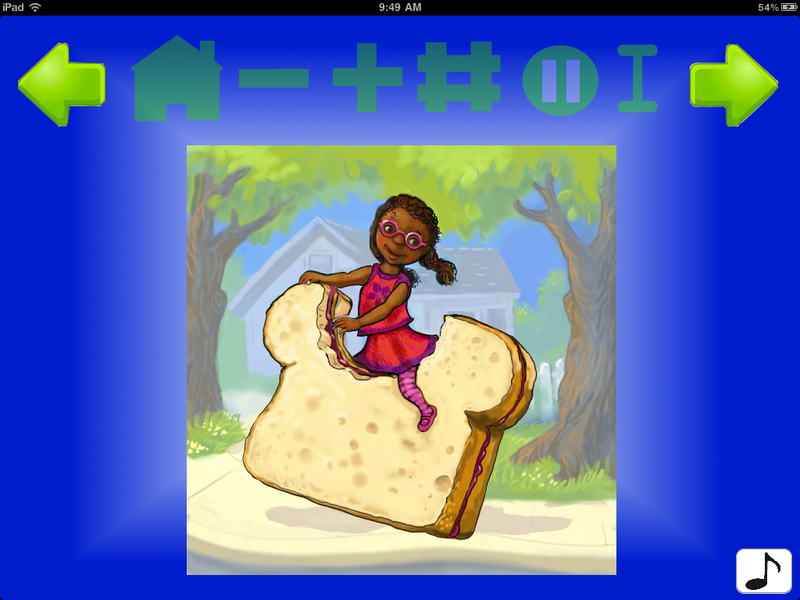 Dawn & Luna's app That's Silly ($.99) is an exemplary boundary-defying early learning app. Kids can play with it by themselves, choosing nonsensical scenes of various complexity levels to compare with the more typical version of the same scene (e.g., in the screenshot on the left, you can swap out the girl's sandwich for a bike). Parents can play with their kids, eliciting language. And the buttons at the top of the screen allow both parents and professionals to track kids' responses, if desired. It's simple, flexible, beautifully illustrated, and fun. I hope other app developers are taking notes. Speech with Milo is focused on developing language skills in children. Created by the licensed Speech-Language Pathologist that brought you five other language apps, to build storytelling and narrative skills. The interactive story book allows children to build skills by telling the story on their own. You have the option of reading and listening to the words that we provide, or you may create your own story. You can turn off the narration and words to create your own story with no distractions. So, again, here we have an app that succeeds because it is special needs professional-developed, rather than special needs-specific. My six-year-old, Mali (who could use more facility with suppressive rather than expressive language) thinks Milo: Interactive Storybook is fabulous because of its story, and because she likes playing with the interactive items on the screen and creating voiceovers. Whereas her brother Leo, who has limited expressive language, likes the app because it includes recorded voiceover, so he can "read" himself the story. Note that neither Milo: Interactive Storybook nor That's Silly costs more than two dollars. And with both apps, kids of varying needs can learn, and have fun. Everybody wins. Disclosure: I was given a promotional code for Milo: Interactive Storybook, but all opinions expressed in this space are my own. As always, I only write about the apps I think are worthwhile. My grandson loves the Milo Storybook app! And based on your comments here, I just purchased "That's Silly." I think we'll have great fun with it, too. Perhaps as the budgets are slashed the penalty costs will shrivel up. Marketers figure the costs are covered by insurers -MEDICAID, which soon won't cover much of anything, near as I can tell, or corporate care-givers (therapists, educators, etc). BTW my favorite example of this is wheelchair v. bike tires. Outrageous. I used to be a programmer and in December will graduate as an SLP. I want to see these apps in action, use them with my clients, and develop my own! I'm so with you that charging more for apps that can be used in therapy is ridiculous. An SLP is going to create materials all the time anyway, so why not share the wealth and lighten the general workload? I'd like to see (or develop) apps that provide a framework for non-programmer SLPs/other therapists to incorporate their own materials and make kid- or target-specific apps on the fly. It's so stupid but I'm dying to win an iPad2 in a drawing my dentist has this week: I can't afford to buy one. It's unfortunate. I agree if there's minor additional development needed to rework an app for special needs, then there shouldn't be a special needs penalty. However, if additional development is significant then developers will probably consider how many customers there are for the additional work in determining how to recoup the cost. There's a lot of myth surrounding iOS development about being able to create and ship a high quality app in a handful of weeks. In truth, many of the best apps in the store can take a small team months, even a year, to create. The cost for production value and high quality is not trivial. Developers attempting to make a sustainable business with high-quality $1 and $2 apps are playing a numbers game. They are shooting for a customer base in the hundreds or thousands or even millions. It's a business model that's a lot closer selling hit single records in the 1950's than it is to selling traditional software. My guess is whatever perceptions they have about the size of a market segment has a big influence on the price they select. I don't think this kind of bias is only applied to special needs. You see the same thing for apps in sports, business and other specialties. The more specific they are in the market segment they're targeting, the more upward pressure there is on the price point.